Daniel Kleinhandler, executive pastry chef at Bar Boulud and Boulud Sud. “Everyone wants a warm hug for dessert,” said Daniel Kleinhandler. But there are many types of hugs: The comforting hug between parent and child, the different kind of comforting hug between adult and parent, the fraternal or sisterly hug between friends, the sensual hug of romantic partners, the awkward hug between acquaintances when they realize they don’t really want to hug but it’s too late to pull away. 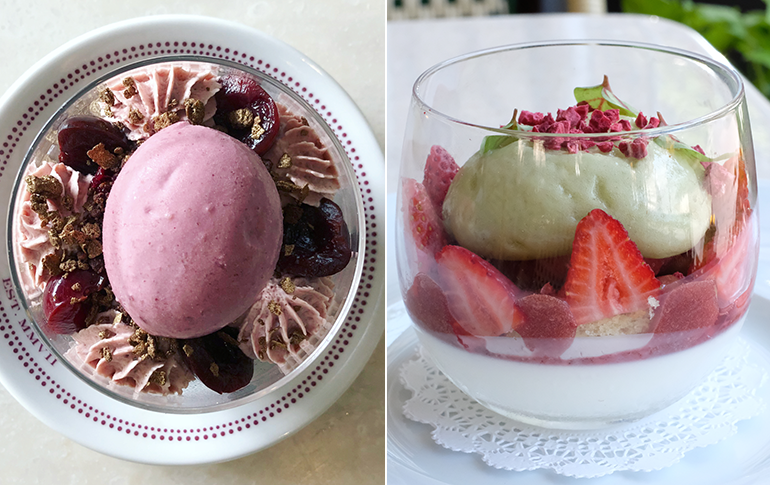 And, it turns out, the desserts people are looking for at the two restaurants where Kleinhandler is executive pastry chef are different, too. The Brooklyn, N.Y., native oversees the desserts of Bar Boulud and Boulud Sud, two restaurants owned by legendary chef Daniel Boulud. They’re basically next door to each other, across the street from Lincoln Center in Manhattan, but the menus are quite different. 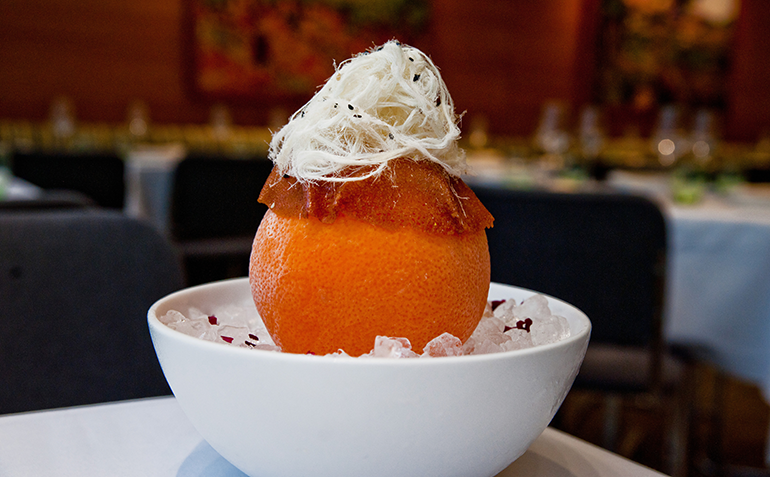 Boulud Sud's Grapefruit Givré is a hollowed-out grapefruit filled with grapefruit sorbet, sesame and rose lokums, topped with halva floss. Bar Boulud is French comfort food — escargots, coq au vin, French onion soup (all elevated, of course) — and charcuterie. Boulud Sud draws inspiration from across the Mediterranean, from Morocco to Italy to Lebanon — chicken tagine, lemon-saffron linguine with cuttlefish, Lebanese flatbread with za’atar and charred scallion. Despite the richer foods at Bar Boulud, “they want a chocolate tart at the end,” Kleinhandler said. 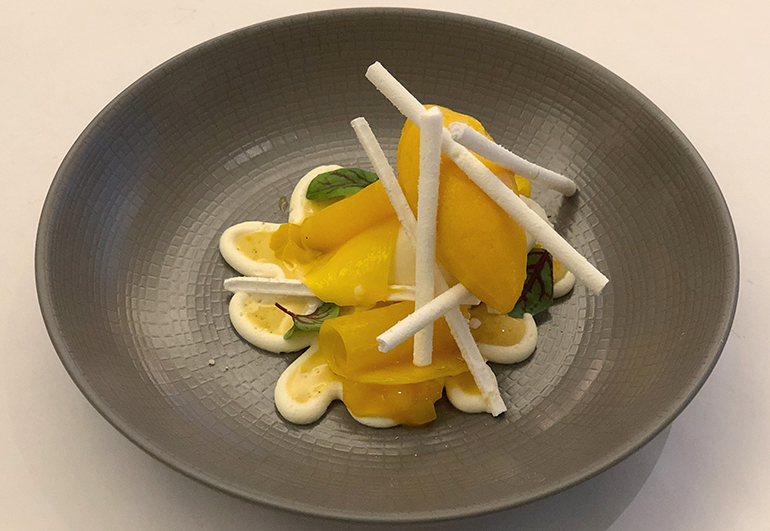 At Boulud Sud, on the other hand, the more intense flavors call for a lighter dessert, such as the Grapefruit Givré that was actually developed by his predecessor, Ghaya Oliveira, who’s now the executive pastry chef at the Dinex Group’s flagship, Restaurant Daniel. The givré is a hollowed-out grapefruit filled with grapefruit sorbet, sesame, and rose lokums (sweetened gelatinous starch also known as “Turkish delight”) and topped with halva floss. Kleinhandler enjoys the science and art that define the pastry world. “My dad has always been a science person and my mom has always been an art person. I’ve always kind of been that blend,” he said. He got bored in science class, but disliked the lack of structure in the art world. Two of Bar Boulud's coupes, or desserts in glasses: Black Forest Coupe Glacée (left) and Strawberry Coupe Glacée. In the middle, he found cooking. At the age of 14 he got an internship at a small wine bar owned by a friend of his uncle’s. As with many chefs, he felt right at home. “I was like, ‘Wow. This feels right for some reason. Why haven’t I found this until now’?” he said. Through the father of a friend he got an internship with pastry chef and chocolate maestro Jacques Torres, who moved him along to stage at Restaurant Daniel, where he was given grunt work like cutting Tristar strawberries into brunoise. He eventually worked at all of the Dinex restaurants in New York, and also studied cooking at Johnson & Wales University in Providence, R.I.
Mango and Cardamom Vacherin at Boulud Sud. After a brief internship at Michel Roux’s Waterside Inn in Bray, England, he returned to New York City and worked mostly with the Dinex Group again, but he also had stints under another legendary French chef, Jean-Georges Vongerichten, and for a while he worked at the fairly short-lived but ambitious Gilt at The New York Palace hotel. “Gilt really had no food cost limits,” said Kleinhandler, so they bought peaches that were $3.70 apiece from a farm near San Francisco. “Mind you, they make every other peach in the entire world taste like nothing,” he said. But now he settles for peaches from a small farm in Georgia that cost a not insubstantial 70 cents apiece. “They don’t have a national distributor, so I have to buy it with a credit card and have them ship it to us overnight,” he said. Kleinhandler aims for a 20 percent food cost — high for pastries — “but I’m big on giving value in terms of quality of ingredients,” he said. Besides, he said, labor cost is more of a concern, and he saves on that through clever strategies such as poaching the peaches by pouring hot syrup over them and letting the heat from the syrup cook them. That way a cook doesn’t need to watch over them. That’s for a summertime Bar Boulud dessert of Peach Melba, which also has raspberry coulis, candied almonds (Marconas, for another food-cost hit), vanilla ice cream and whipped cream. He serves it in what he says is the perfect glass for it. “It hugs the peach just right, the Chantilly [whipped cream] comes just to the edge and sits just right, and you can’t help but eat it,” he said. 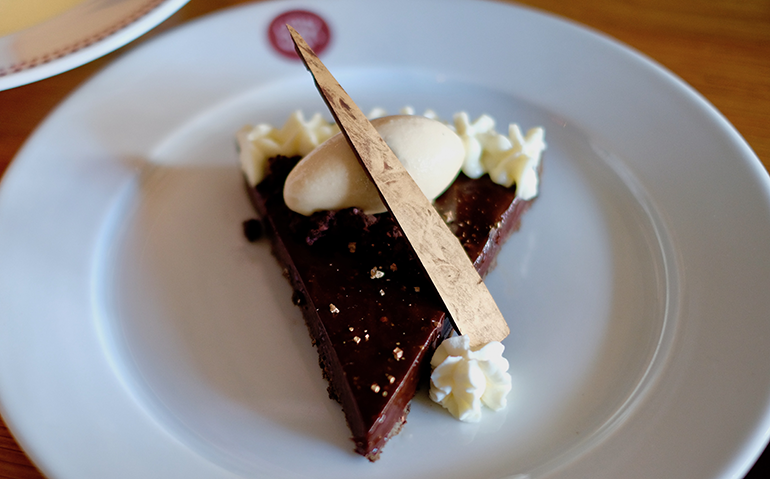 In the end, diners want a chocolate tart, Kleinhandler says. Bar Boulud has a whole dessert section for coupes, or desserts in glasses, including his Black Forest Coupe Glacée. “It’s just layers of chocolate cherry goodness,” he said, and it’s better in a glass than as a cake. “In a cake, you’re limited to what texture you can have. In a glass, it doesn’t have to fully set. Everything can be a little softer, a little creamier, a little more sundae-ish,” he said. Whereas at Bar Boulud Kleinhandler sticks to modern versions of the classics, at Boulud Sud he can go farther afield, such as to Iran, which was the inspiration of the rhubarb muhallebi he made in the spring. Muhallebi is a Middle Eastern custard with a base of milk and rice flour or cornstarch, traditionally flavored with rosewater or sometimes orange blossom. “Rhubarb and nuts go great together, but we didn’t want to do another nut dessert because we had a nut-based tart at Bar Boulud,” said Kleinhandler — a classic almond-rhubarb preparation. Actually, they did coconut milk, which replaced the dairy. To add brightness, he brought in mint oil — made by steeping mint into a neutral-tasting oil — and emulsifying it with coconut yogurt. “We essentially made a sweet mayonnaise with mint oil and sugar,” he said. Sometimes a dessert Kleinhandler plans for Bar Boulud ends up evolving into a Boulud Sud dish. That happened this summer, when he topped sheep’s milk panna cotta with fresh strawberries and strawberry marmalade that he glazed with sorrel oil for brightness and acidity and topped with wild strawberry sorbet and sorrel espuma. “In my mind, I was sure it was going to be a Bar Boulud dessert — very simple. But it grew into this gorgeous Sud dessert that went much more Middle Eastern flavors,” he said. Sometimes you don’t know what a hug’s going to be like until you try it.